Rectangular Invent Tabletop Is Part Of The Lorell Training Table Collection That Offers Convenient Configurations For Your Training Needs. 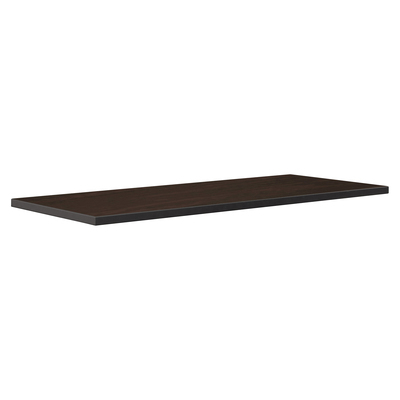 1" Thick Top Is Made With High-Pressure Laminate For A Durable Worksurface. Stain-Resistant, Scratch-Resistant Laminate Is Thermofused On The Top And Bottom To 45 Lb. Density Particleboard Core. Design Also Features Matching, Espresso Pvc Edge And Squared Corners So Tables Smoothly Fit Together In Groups. Optional Ganging Connector (Sold Separately) Secures Tables Together And Quickly Detaches For Easy Reconfiguration. Optional Modesty Panels (Sold Separately) Include Wire Channels For Wires To Pass Through The Bottom Of The Panel. Tabletop Includes A Predrilled Hole For Easy Mounting Of The C-Leg Base With Casters Or Glides (Sold Separately)..
Rectangular Invent Tabletop Is Part Of The Lorell Training Table Collection That Offers Convenient Configurations For Your Training Needs. 1" Thick Top Is Made With High-Pressure Laminate For A Durable Worksurface. Stain-Resistant, Scratch-Resistant Laminate Is Thermofused On The Top And Bottom To 45 Lb. Density Particleboard Core. Design Also Features Matching, Espresso Pvc Edge And Squared Corners So Tables Smoothly Fit Together In Groups. Optional Ganging Connector (Sold Separately) Secures Tables Together And Quickly Detaches For Easy Reconfiguration. Optional Modesty Panels (Sold Separately) Include Wire Channels For Wires To Pass Through The Bottom Of The Panel. Tabletop Includes A Predrilled Hole For Easy Mounting Of The C-Leg Base With Casters Or Glides (Sold Separately).